As ECAS can be accessed with the help of Wi-Fi and LAN, you can access it from anywhere in the campus. You dos not need to rely on one PC or laptop for accessing this system. If your institute has several branches, this software is a great tool to share all the data and information. You no longer have to rely on posts or emails to transfer data from one point to another. Admissions, tests, result display, alumni registration, etc. can be done using this online software. The test reports and such other details available on ECAS can be exported and presented on your institutes website. Apart from providing complete online connectivity with other branches of your institute, this software also offers several other beneficial features to the user. As each institute is different and has different goals, the software can be customized as per your requirements. The software interface is user friendly. A similar trend of operation is presented throughout the software, so there is no confusion as to the workings of each operation. The software keeps all data safe. You can channelize the data by providing limited access to each member operating the system. Every entry in marks, master or financial database bears the signature of the one who operates it. Creating test reports is no longer a time consuming process. The software has the ability to create different types of reports, even elaborate ones. These layouts can also be customized. The software is compatible with different types of ACS like smart card machines, finger print reader, etc. Attendance can be integrated into the software automatically. Other than this, the software is also compatible with barcode reader. ECAS supports touch screen display of certain modules. You can manage some of the activities using a touch screen interface. These include posting leave applications; uploading documents; viewing candidate accounts, attendance information and marks; and providing library reservation requests. 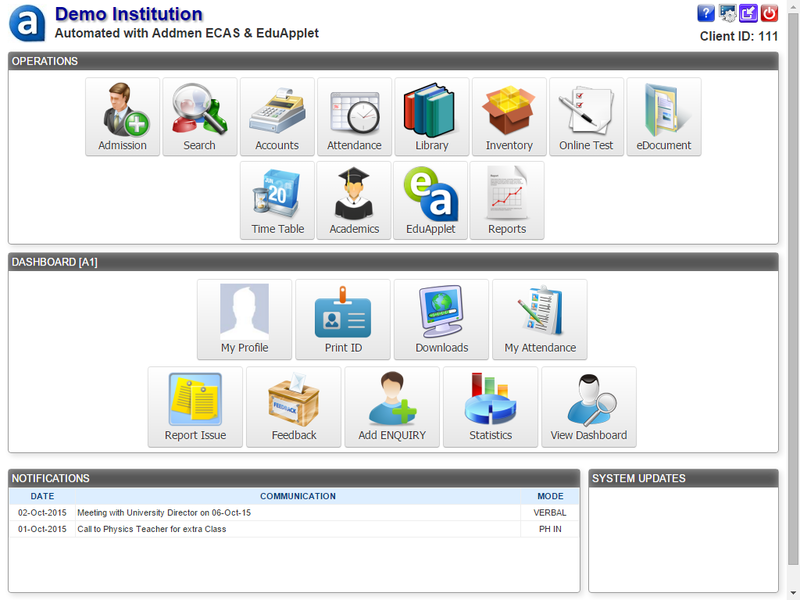 The online connectivity features of ECAS are what make it popular amongst educational institutions. 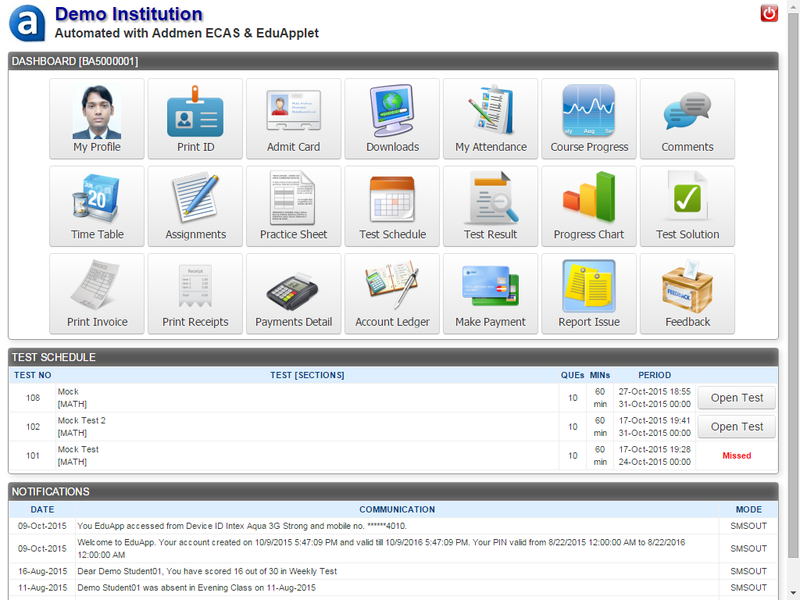 These will help you to simplify your institutes's administration and management processes.